Why go to the wine store when it can come to you? There comes a point in a newbie oenophile’s development when they suddenly realize that their road trips to wine country have increased in frequency, as have their visits to the local wine store. That’s when it can make more sense to join a wine club. Besides, having wine handpicked by a pro and then delivered to your doorstep feels like Christmas. Here are some of the best wine stores in Los Angeles which also happen to have their own wine clubs. And, unlike the clubs of Napa or Santa Ynez, you can very easily forgo shipping and pick up your wine at the store. No road trip planning necessary! If Eagle Rock is a haul but you can’t get enough of this wine bar/store, lucky for you it has a club. Just take your pick of which of the three suit your taste. “The Yummiest Trio” offers two reds and one white that proved the “yummiest,” “Me and CoWineCo–Best Friends Forever” has three favorite bottles of varying varietals, and “Seeing Red” is comprised of three favorite reds. Perk: Members get a 10 percent discount on each month’s selection at the store during the month they’re featured. Domaine LA’s Jill Bernheimer offers two clubs for two different types of wine drinkers. The Gastronomist Club is for those who want to build their wine knowledge as it features traditional, food-friendly wines that are perfect examples of their regions. The Naturalist Club, on the other hand, is for the more adventurous drinker with its selection of avant-garde wines that “push the envelope from a style.” Perk: Members get entry to the monthly Sunday tastings for a $1. K&L, one of the largest wine retailers on the West Coast, has been selling premium wines since 1976. Thanks to long-standing relationships with wineries and wine wholesalers as well as regularly going on worldwide buying trips, the clubs are able to offer a variety of wines and at different price tiers. So if you’re a newbie and just want to ease into things there’s the very wallet-friendly $19.95/month “Best Buy Wine Club.” From there you can jump on up to the Premium club, Signature Red, Club Italiano, or, for straight bubbles, the Champagne Club. A personal sommelier service is also available for those who prefer to choose their own price range, varietal and country, and number of bottles per month. Perk: Members can reorder previous club wines through its Web site. This wine store gives you the unique option of upgrading from two bottles (a white and a red) to one nicer bottle of wine for the same price. So take your pick of “The Front Table Club” ($25), “The Glass Top” ($50), or “The Back Wall” ($75). It also boasts a small-town feel in that it doesn’t choose wines it’s featuring for the month but what you tell them you like and dislike. And they keep track of each and every customer to make sure there aren’t any repeats. You can either do pay-as-you-go indefinitely or do a three-, six-, or 12-month membership. Perk: The store can make adjustments for you, like in the summertime if you like rose, they’ll send that instead of white. Vintage Wine Market and Vintage Enoteca owners Jennifer Moore and Danielle Francois wanted to approach the wine club concept for their Palms store a different way than other clubs. “We’re looking at our wine club as a fun clubhouse for adults–we’re focusing each month on an exploration of a provocative or unknown region and/or unknown varietals from small producers that you can’t find at many wine stores or restaurants,” said Moore. 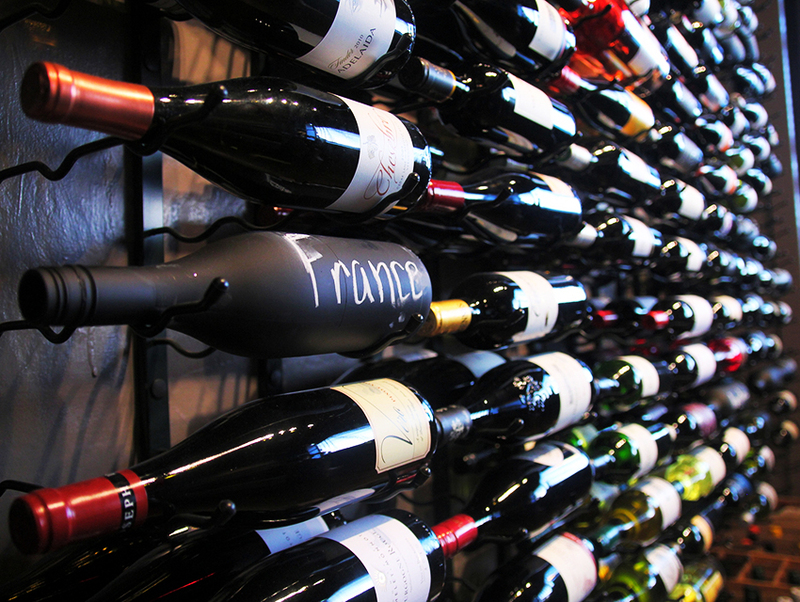 Wine Director and sommelier Francois chooses the wines which are available in three-, six-, or 12-month commitment. For this month Francois chose wines she felt would pair well with the holiday feast: the 2013 Vin Gris of Grenache from Yorkville Highlands, “the perfect candidate for that versatile, start-to-finish holiday wine,” and the 2013 Valdiguié from the Enzenauer Vineyard in Dry Creek Valley with a “gulp-able vibrancy.” Perk: Members get a 10 percent discount on each month’s selection at the store during the month they’re featured. When you join a Wally’s Wine Club, you actually get a Welcome kit that includes a tasting journal, corkscrew, vintage chart, and even a food/wine pairing wheel. Choose between the Collectors Club ($97) featuring exclusive wines or the Reserve Club ($61.99) showcasing new releases, single vineyard selections, and “off the beaten path” wines. Perk: Members get free entrance to the store’s Saturday tastings.